$113,000 is the avg. salary for a US analytics/data mining professional, up about 10% from 2010. Salaries also went up in W. Europe, Asia, and Latin American regions. What is your annual salary and employer type? The analysis was based on about 250 respondents, from which 78% worked for a company, 18% for a University, and about 4% were self-employed. The average US salary was estimated as $113,000, up about 10% from 2010. The European salaries also increased among KDnuggets respondents, to $78,000, 15% up from 2010. 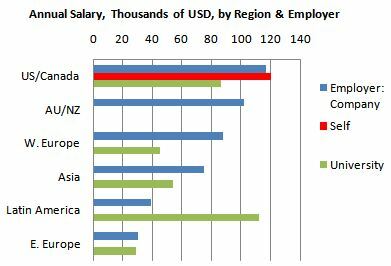 Comparing with a similar KDnuggets 2010 data miner salary poll, we note that salary went up in US/Canada, W. Europe, Asia, and Latin American regions. The following figure gives a salary breakdown by employer. The self-employed salary is shown only for US/Canada - in other regions there were too few self-employed to draw inferences. What is your annual salary/income and employer type?